Southwest Airlines Co.’s generic strategy for competitive advantage (Porter’s model) ensures product/service attractiveness for successfully implementing intensive strategies for growth (Ansoff Matrix). With a strategic position as one of the main competitors in the commercial aviation industry in the United States, the company is popular for its low fares and high accessibility. These variables directly relate to Southwest’s intensive growth strategies and generic strategy. In Michael E. Porter’s model, competitive advantage is developed through a number of generic strategies that the airline company can apply. On the other hand, in Igor Ansoff’s matrix, a firm like Southwest Airlines can use various intensive growth strategies. These corporate strategy frameworks are considered in this business analysis of the commercial aviation company and its approach to growing despite strong competitors. Southwest Airlines’s success indicates effective implementation of a generic strategy for competitive advantage and intensive growth strategies suited to the business. Southwest Airlines uses its generic competitive strategy to counteract the competitive power of other firms, such as Delta Air Lines, United Airlines, and American Airlines. These competing commercial aviation companies possess resources and the operating scale to grow despite the competitive landscape. Southwest Airlines Co.’s intensive growth strategies facilitate the operational scale needed to maintain the corporation’s generic strategy, thereby also strengthening its competitive advantage and competitive positioning in the industry. Southwest Airlines Co.’s generic strategy is cost leadership, which creates competitive advantage based on low costs and correspondingly low prices. To address competition, the company’s strategic objective in this generic strategy is to minimize operating costs, optimize profit margins, keep low prices, and offer its airline services to the mass market. The large-scale operations linked to this generic strategy for competitive advantage supports the fulfillment of Southwest Airlines Co.’s mission statement and vision statement, which aim for global leadership in the industry. The commercial aviation corporation’s success depends on effectiveness in implementing the cost leadership generic competitive strategy. The cost leadership generic strategy is observable in Southwest Airlines and its service offerings as a low-cost carrier. For example, the company’s advertising campaigns frequently emphasize low fares as a selling point, in contrast to other firms that use the focus strategy or the differentiation strategy, such as Delta Air Lines. In a way, Southwest Airlines has a best-cost provider strategy, as the company continues to minimize costs while also maintaining a high level of customer satisfaction through service quality. Based on its generic strategy, the enterprise presents itself as a major commercial aviation contender not just in terms of prices, but also in terms of warmth and friendliness in its customer service. Market Penetration. In line with its generic strategy, Southwest Airlines applies market penetration as its primary intensive growth strategy. The company’s strategic objective in this intensive strategy is to grow its business revenues by providing more of its current air transportation services to more passengers in markets where it currently has operations. Southwest’s cost leadership generic strategy ensures low costs, which translates to across-the-board low prices that are a competitive advantage for keeping a large share of the commercial aviation market, in support of the market penetration intensive growth strategy. The price sensitivity of customers in the transportation sector is one of the factors that make cost leadership and market penetration effective strategies in this case. Business strengths and competitive advantages, identifiable in a SWOT analysis of Southwest Airlines Co., help attract customers and support the success of market penetration. A strong airline brand and attractive prices enable this intensive growth strategy. Also, Southwest Airlines Co.’s marketing mix (4P) determines how the company penetrates the target market. Product Development. Product development is a minor intensive growth strategy in Southwest’s organizational development. The corporation focuses mainly on its cost leadership generic strategy for competitive advantage, and the corresponding market penetration intensive strategy for airline business growth. Southwest’s product evolution has already stabilized, which means that the business has been aiming its product development efforts mostly at enhancing its current offerings. Thus, product development, as an intensive growth strategy, has minimal contribution to growing the airline company. It is notable that changes in current products require corresponding changes in Southwest Airlines Co.’s operations management strategies and tactics. The company’s operations management is a manifestation of the applied intensive growth strategies and generic strategy for competitive advantage in commercial aviation. The corporate culture of Southwest Airlines Co. is a factor integrated into product development, as the company relies on organizational cultural variables to optimize its service quality and corresponding customer satisfaction and loyalty. Market Development. The growth of Southwest Airlines minimally depends on market development. This intensive growth strategy aims to offer current services to new commercial aviation markets. When applying market development, the cost leadership generic strategy ensures competitive advantage for new civil aviation markets. However, Southwest continues to focus on its limited multinational operations in the United States and a few other countries. Thus, the market development intensive growth strategy is not significant in growing the airline business. Diversification. 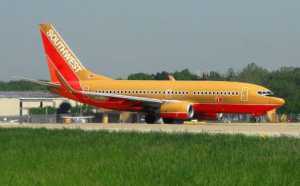 Diversification is currently an insignificant intensive strategy in Southwest Airlines Co.’s business growth. The objective of this intensive strategy is to grow the company through new operations, such as service businesses related to air travel operations. Southwest focuses on growing within its current markets, with minimal emphasis on using its cost leadership generic strategy for competitive advantage in diversifying its business. Thus, diversification is an insignificant intensive growth strategy in the airline business. It is notable that the addition or expansion of business operations requires accompanying changes in Southwest Airlines Co.’s corporate structure. Southwest Airlines applies the cost leadership generic strategy for competitive advantage, along with intensive growth strategies to maximize market share and move toward its long-term goal and strategic plan of becoming a global industry leader. The market penetration intensive strategy provides support for the airline company’s cost leadership generic strategy, and vice versa. Southwest’s brand image and service quality reflect these strategies and associated competitive advantages. For example, customers know the company for low airfares, which are a consequence of the cost leadership generic strategy that leads to cost-based and price-based competitive advantage. In relation, Southwest is known for its large-scale operations, which are a result of the market penetration intensive growth strategy. Acar, A. Z., & Zehir, C. (2010). The harmonized effects of generic strategies and business capabilities on business performance. Journal of Business Economics and Management, 11(4), 689-711. Andersson, S. (2006). International growth strategies in consumer and business-to-business markets in manufacturing and service sectors. Journal of Euromarketing, 15(4), 35-56. Hussain, S., Khattak, J., Rizwan, A., & Latif, A. (2014). Interactive effects of Ansoff growth strategies and market environment on firm’s growth. British Journal of Business and Management Research, 1(2), 68-78. Miller, D., & Friesen, P. H. (1986). Porter’s (1980) generic strategies and performance: An empirical examination with American data: Part I: Testing Porter. Organization Studies, 7(1), 37-55. Saputra, A. R. P., Haryono, T., & Untoro, W. (2019). Green Products Strategy Impact Of Generic Porter Strategy On Company’s Performance. International Review of Management and Marketing, 9(1), 52-61. Southwest Airlines Launches new Ad Campaign Showcasing Low Fares and Employees. Southwest Airlines Ranks Highest in Customer Satisfaction Among Low-Cost Carriers in North America According To J.D. Power. Tanwar, R. (2013). Porter’s generic competitive strategies. Journal of Business and Management, 15(1), 11-17. Tassey, G. (2012). Beyond the business cycle: The need for a technology-based growth strategy. Science and Public Policy, 40(3), 293-315.